In our last blog, Fr. Bob Weighner introduced the fourth and last leg of our Catechism of the Catholic Church, “how we pray,” discussing the many forms of prayer. Here, Linda Bevec, parishioner of St. Anne gives her personal witness on the power of praying the Rosary. Linda has been a parishioner for six years along with her husband Frank and children Frankie, Claire & Grace. She was baptized Episcopalian, raised Lutheran, sprinkled with a variety of Evangelical Christian beliefs and has loved growing her faith the most in the Catholic church for 17 years. break my mother’s back. It seemed to me a senseless recitation of detached words for the sake of earning divine graces. As a Lutheran, I felt rather privileged to bypass those ancient rituals and go right to the front of the line in prayer with a “fast pass” to God. No Rosary for me, thank you. Don’t Catholics know they can just pray directly to God? choose, I opted out of that one and took what I was willing to accept as being “just enough” Catholic to get by. Then, in March 2011 something unexpected happened. While in the neonatal intensive care unit with my newborn daughter Claire, I stepped out to the waiting room for a cup of coffee. The days were long and exhausting. Claire was in critical condition after being diagnosed at birth with a rare genetic kidney and liver disease and she was not expected to survive. And as I poured myself a cup of coffee, I sat motionless for some time staring blankly at the TV. I remember a woman sitting in the corner busy making something with her hands and thought perhaps she was knitting. I paid her no attention. I was so weary, so emotionally drained and broken down that I truly felt transparent, as if no one could see the sorrow in my heart or know my pain over the very real possibility of losing my newborn daughter. And then the woman who had been sitting in the corner of the room got up and stood in front of me and handed me a Rosary. And all she said was, “I made this for you and I’d like you to take it.” I took the Rosary into my hands and thanked her. She smiled and walked out. I spent the next 3 months in the hospital going in and out of that waiting room for coffee several times a day. I never saw her again. twice in those 9 years and I always kept it in the same drawer. was struggling with in my life as a woman of faith, a wife and a mother. And that was the first time I prayed the Rosary. 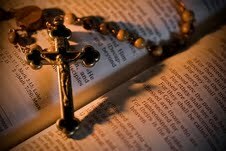 The Rosary is a perfect blend of vocal, meditative and contemplative prayer. (More on these types of prayers can be found in the Catechism of the Catholic Church, 2700, 2705 and 2709). The Rosary is a walk with Mary, the mother of our Lord, through the mysteries, joy, life, suffering, death and glorious resurrection of her son. And it’s a walk through our lives too where we can bring our own hearts full of joy and sorrow, fear and failings; and reside in her love as she transforms us with peace, faith and forgiveness. It’s a prayer that has deepened my faith in unexpected ways and has given me a closeness with Christ through her. I pray that you will open your hearts to her love in this beautiful gift of the Rosary. It was a long process for me to get to that point. But she was there waiting for me all that time and she’ll be there for you too.